Lawrence is different in terms of talent. He'll threaten Bama vertically. But I can't see Saban losing to a true Fr QB. Lawrence is mobile enough but not a big threat to make big plays running. I do think Clemson has been prepping for this game since the buttkicking they took last year. It will be competitive. Bama probably wins but it'll be a close game. Would love to see Clemson pull it off. Cheering for Clemson, but I think Bama wins in a very close battle. May even go into OT. Didn’t know GoHogs1091 was also LR Randy. Fair or not, compared to Deshaun Watson Lawrence is a statue. You give the Alabama Defense a (fairly) stationary QB and watch the carnage. I think Alabama will win the game, as Clemson is good enough to bring out the very best in the Tide. Most teams aren't. After jumping OK to the tune of 28-0, it appeared to me as if Bama let off the gas and just got bored. It can be very hard for any team, even as talented as Alabama, to mash that peddle back down. I do not think, not for a minute, that Alabama will find playing Clemson "boring." Alabama, because they have Saban. If Clemson had Saban I'd pick them. Clemson can now go toe to toe with talent and depth, minus QB probably. I see a 41-38 type score down to the wire thriller. That said, I'm pulling for Clemson, unless Nick promises to retire with a win. I'm conflicted. I like Dabo and Clemson but will probably pull for Bama just to see the comedy from GoHogs once Clemson loses. Any thoughts on Perry Maxwell? well it sure won't be Bret Venables fault I can gar-on-t it. And you can gar-on-t it since Bret Venables does not coach at Clemson. Clemson was embarrassed vs Bama last year. They have something to prove. The oddsmakers say Bama by 6-7. The sports commentators say Bama. Clemson feels disrespected. Bama won last year -- won two out of three years now -- and Saban has won six championship. In other words, the game has become old hat -- they would love to win, but not sure the fierce motivation is there having won last year. Clemson's entire DL came was eligible to go to the NFL last year, and they came back with one goal in mind -- winning a championship. I think they do it this year. It’s going to be a good game and Clemson has a good chance to beat them. However, Bama is dang good. I think if they played ten times Bama would win at least seven. I expect that we’ll see a score in the 28-24 or 38-27 range. Again though, it wouldn’t shock me to see Clemson win. What’s going to be beautiful about this game is that you will have four elite lines squaring off. My one caveat is, if they make Lawrence look like a freshman and get a few turnovers, Bama could roll them. Clemson cause I am sick of Bama so until they don't it's Clemson. Clemson. Trevor Lawrence is the best QB I have seen period. I believe if he was available for the NFL draft, he would be the number one pick today. He's that good. He's also surrounded by elite playmakers and a nasty defense. They're well coached. They're ready...now try not to get blown out! I have a reputation to uphold. Clemson can win this one. This game is close across the board. For the most part it is strength against strength, so who blinks first? Who gets the lucky bounce? Will be fine whoever wins. I like what Dabo has done to turn Clemson into a top program (and not just on the field). But if I had to bet my house, I'd go with the Tide. If you gave me a Clemson hat I would wear it. I’m a big fan of Trevor Lawrence. Should be another good game. If I were betting I would say Bama. However. Clemson matches up well. They have a dominating DLine that put pressure on Tua without help. Both teams have good Olines. Both teams obviously have great QBs. One thing Bama is not great at is corner. Clemson is going to pick on that freshman corner like a itchy scab. Another thing is placekicking. They've had some issues with that. And like some said. Clemson just wants it more. Saban or not, he can't play on the field. Double digit win for Alabama. The defensive lineman from Clemson that was suspended in the ND game for PED (however slight the detection was), was he suspended just for the ND game, or for this AL game too? Shouldn't be an obvious difference either way. Clemson's DL is fantastic regardless. I think Clemson is more complete. Baring a bunch of turnovers or injuries, I think Clemson will win a close one. I think Bama wins this by 10-14 points. Clemson's pass defense is very porous & will get torched by Tua. Clemson will get some points but I can't see them outscoring Bama. The Tide wins 35-24 or 35-21. Clemson is 18th in the nation in pass yards allowed. They have given up 11 TD's through the Air. Alabama is 13th in the nation in PYA. They have given up 17 TD's through the air. Not a lot of difference between the two. Bama does rank high in Passing Offense at 7 while Clemson is at 28. Rushing-Clemson dominates Bama in both Offense (9) and defense (3) against the rush. Bama rush O (36) rush D 18. Clemson's ability to run the ball will open up the pass. Clemson's D can shut down the Bama run and if they do that and Bama primarily goes to the pass, Bama will lose. Clemson +6 is a gift but I'll go money line at +180. As I understand it all 3 of the Clemson players who tested positive are banned from play for the remainder of this season and all of next season. Two are Juniors and will probably declare for the draft the 3rd is a Frosh and will lose a year. can we get a "well check" on gohogs? in before he breaks down the whole season for both teams, how much ice (actual numbers of cubes) in the gatorade buckets and an honorable mention to Clint Conque. I want BAMA to win by something like 52-20 with the 20 coming with 2 late 4th quarter tds against the subs. Highly unlikely to happen though. As Holtz would say, Clemson isn't the Little sisters of the Poor. Unless you've been old, you cannot understand what Saban feels. I understand old. He clearly knows that he may never get another chance to play in this game. Dabo cannot understand this, he too young. If either team flinches, other team gonna jump. Barring mental letdown by either team, I see close game with BAMA winning and covering the spread. 1. I hate Alabama more than any other program. 2. I believe it would help with recruiting. CCM can point to this Clemson team and tell recruits, "that is what we are going to look like." It would be good for all of college football to see the God-King bleed. If there is a single factor that will determine the outcome I agree it will be can Bama get pressure on Lawrence with 4 to 5 men. I think this is difference Bama by 10. Better coach will beat the cheer leader. Clemson is not able to line up and beat Bama. However, if Bama has a couple turnovers or penalties that kill their drives and/or extend ones for Clemson then they could be beaten. Clemson can't line up and beat Bama ... but Bama can lose if they hurt and beat themselves. 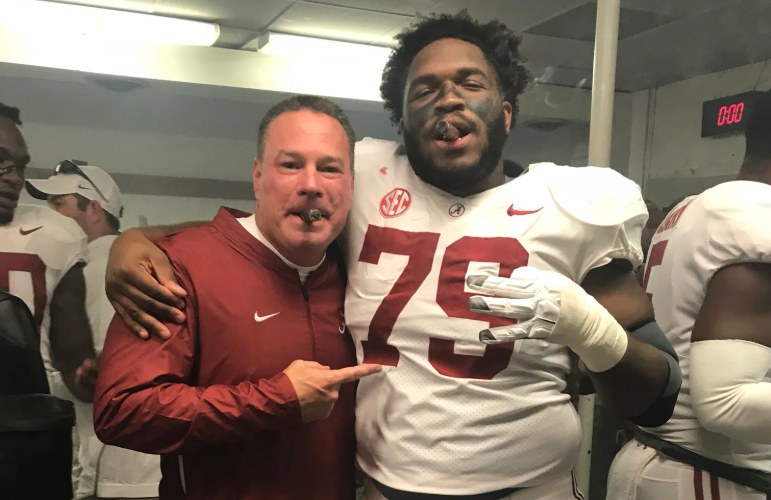 The only thing that really irks me is Butch Jones grinning like a fool on Alabama's sideline acting like he had something to do with them winning. Dude is a jack a$$. He's a saint compared to some of the coaches who have gone through Nick Saban's Cheating Coach Halfway House & Career Rehab Service. Butch is a goob. Glad he finally has something to celebrate. Also, when does this post verification go away? That’s exactly what’s going to happen...Clemson is gonna line up and run all over Bama. Bama does to Clemson what they've done to everyone else. Bama by 17. All out blitzkrieg on the young QB. Chinks in armor finally appear.